Although St. Louis is listed officially as one of the "most probable targets for atomic attack," there are no immediate plans to equip this area with anti-aircraft weapons capable of stopping Soviet Russia's best planes. This was disclosed to the Globe-Democrat yesterday by Army and Civil Defense authorities. The Army announced Thursday that anti-aircraft defense planned for St. Louis consists of 32 90-millimeter guns to be installed by mid-1957 and manned by National Guardsmen. The 90-millimeter weapons cannot bring down planes flying at 40,000 feet or beyond the speed of sound. Such ships can be tracked and destroyed by the Nike guided missile. "To our knowledge, there are no immediate plans to bring the Nike to St. Louis," sain Lt. Col. J.H. Farren, executive officer of the Army Central Anti-Aircraft Regional Command at Grandview Air Force Base, south of Kansas City. "We are basing our plans for St. Louis on a 90-millimeter defense and not a missile defense. In two or three years, St. Louis might get something better." About one month later, U.S. Congressman Frank M. Karsten from St. Louis asked that "St. Louis be put on the priority list of cities which will receive Nike guided missiles for defense against hostile aircraft," or at least have 120mm guns installed instead of the older 90mm guns. Based on the i nformation available, Karsten's arguments proved effective. Two weeks after his complaints were printed, the Defense Department informed Karsten that it was asking the Army to resurvey the St. Louis defenses. In May 1956, the people of St. Louis learned that the deployment of Nike Hercules batteries around their city might occur within the next two years. Until that announcement Army officials had been somewhat vague about air defense plans for St. Louis, committing only to the 90mm guns. There was some speculation that the Army chose to announce the deployment of Nike missiles because of Air Force promises that the air approaches to St. Louis would be protected by its Tales and BOMARC missiles. Four sites were chosen for the installation of Nike Hercules missile facilities for the St. Louis area: one near Pacific, Missouri, and the three others in Illinois, at Hecker, Marine, and Pere Marquette State Park, near Grafton. Each site is located about 35 miles from St. Louis. The headquarters for the battalion deployed at St. Louis was Scott Air Force Base, near Mascoutah, Illinois. The bases were built under the supervision of the Chicago District of the Army Corps of Engineers. One Nike Hercules battalion served the St. Louis Air Defense System. The 62nd Air Defense Artillery, Ist Automatic Weapons Missile Battalion activated June 1, 1959, at St. Louis, Missouri, under the command of Lt. Col. Robert H. Zimmerman. It was redesignated December 20, 1965, as the Ist Battalion, 62nd Artillery, and activated January 15, 1969, at Scott Air Force Base, Illinois. 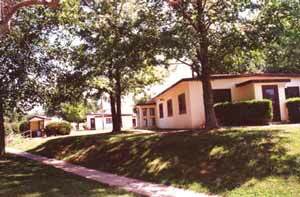 Throughout this time, Scott Air Force Base (SL-20) served as battalion headquarters. Battery A was located at Marine, Illinois (SL-10). Battery B was at Hecker, Illinois (SL-40). Battery C was at Pacific, Missouri (SL-60), and Battery D was located at Grafton, Illinois (SL-90). The St. Louis Defense System was under the 5th ARADCOM Region jurisdiction until 1966, when it came under the 2nd ARADCOM Region, where it remained until the closing of the Nike bases surrounding St. Louis in 1968. The land for the Hecker base (SL-40) had previously been used for farming. In 1958, the Army purchased the land from Charles "Pete" Strautz, a local farmer. The installation encom passed a total of 227.71 acres. The three non contiguous parcels of land were comprised of: 34.28 fee simple acres (20.12 acres for the Housing and Control Area; 14.03 acres for the Launcher Area; 0.13 acres for the well site); 193.18 easement acres (line-of-sight and safety easements); and 0.25 acres leased for a water line. According to the Disposal Plan for Base SL-40, the acquisition cost for this site was $2,638,800. Land costs were $22,450; improvements were $2,600,850; and personal property $15,500. The Army began constructing Nike Missile Base SL-40 in June 1958 and finished one year later, at which time the 62nd Artillery, Ist Missile Battalion, was activated. M.H. Wolfe & Co. and J.J. Altman & Co. of East St. Louis were the contractors for the Marine base (SL10). Fruin-Colman Contractors Co. ofSt. Louis was the primary contractor for the remaining St. Louis bases, including SL-40. Warren & Van Praag, Inc., of Decatur, Illinois, served as a consultant. Students at the Beck Area Career Center in Monroe County visit a part of history every day they come to class. The school occupies neat cream and green painted buildings on the grounds of a former Nike Hercules missile site in Monroe County. Between 1959 and 1969, the site housed missiles, servicemen, radar and other high tech equipment as a part of the St. Louis Area Defense Ring. Since 1972, teenagers and adults from Monroe, Randolph and St. Clair counties have attended the school to take part in three available programs: alternative education for high school dropouts or at-risk students, vocational education and a licensed practical nursing course. The school has seen much success over the past three decades. Visitors to the school are often surprised the original buildings are still intact and being used. "We had a 25th anniversary about three or four years ago and had probably somewhere between 500 or 600 people come out here," said Dennis Works, director of the Beck Area Career Center. " Many people were amazed at the utilization of the site and that we've been able to continue to have great facilities and use them as such for the students and adult educational students in the area." Finding the original buildings on a former Nike missile site is not a common scene, said Andy Jankowski, environmental protection engineer with the Bureau of Land for the Illinois Environmental Protection Agency. "I would say probably 90 to 95 percent of the buildings that were there that the Army had put up for their operation as an anti-aircraft missile facility are still intact," Jankowski said. "You know when you think about it they are approaching 50 years old and so it's really kind of an icon when you think about Cold War history. "There's been some movement to have these sites recognized as national historic places or get them on the registry of National Historic Places," he said.